What if the 7000- year-Time-Frame of our physical existence on earth will not be enough time for all of the souls who have lived in the spirit world to have been personally born on earth, in order to learn the things that God requires for each of us to learn? Some things that are actually much harder to learn in the spirit world as they have to be learnt by ‘Trial and error’ and learning to ‘Live by Faith’ & to ‘Trust God’ even when you can’t directly see Him in the flesh. Learning to totally trust God is very important to Him. I would go so far as to state that I think that it is paramount for ALL of His original creation to eventually learn this principle. WHAT IS THE BEST METHOD FOR TEACHING GREAT MULITUDES? Could our physical universe which according to the Bible and the Apocryphal books centres around the earth, actually be considered to some extent like a Cosmic Amphitheatre, where we on earth are the actors and players in the Cosmic Battle for God and Evil. Our physical realm is obviously surrounded by both good and evil dimensions and there are windows and doors through which the spirits appear and watch us daily. What if God has put many people on many planets that have the ability to actually observe our planet daily, but whom are not allowed to interfere with our majesty of choice. I do not think that physical ‘Aliens’ are going to show up here from distant planets, as the distances are too great! They are allowed to observe and learn from our decisions and from our Faith and relationship with both God and His Holy spirit and Jesus as well as many spirit helpers and angels of God. If there ever is an ‘INVASION FROM OUT SPACE’, I predict that it will be FAKE! Faked by the Fallen Angels, their giant progenies (demons) and their human cronies, to DECEIVE most of mankind into believing the insidious LIE that man was ‘seeded’ on the planet earth millions of years ago. That the ‘Aliens’ are just coming back to see how we are doing and to rescue us from self-destruction. That argument simply does not make any sense because of the LIGHT YEARS of distance involved; and is not backed-up by any real evidence. THE ANTI-CHRIST COULD PUT ON A BIG SHOW in order to deceive the whole world, as he himself will be only part-human. 2TH.2:7 For the mystery of iniquity doth already work: only he who now letteth will let, until he be taken out of the way. Up until this point I have always in my mind’s eye imagined that all of the spirits in heaven stay in that dimension most of the time, except when they are sent on missions to the earth to help individuals with a myriad of needs and to enhance their abilities. I have envisioned the saints of all time who are already in heaven viewing our world directly from their celestial mansions on some sort of 3D TV screen. However, what about those people or beings who have never had the privilege of having lived the earth life, at least not yet? (* It is appointed to men once to die and after that the Judgment) Could many of the planets out there in space be special assigned posts for some of those in heaven who have never been born on earth in the flesh. Places where it is very easy to observe and learn from our mistakes and to get more used to the physical life without necessarily going to earth, at least not quite yet?? It is true as many have pointed out that physically speaking it is not logical for people to travel from one star-system to another at least not with these physical bodies. If, however we think in terms of other higher and lower dimensions where TIME & SPACE are not a factor in the sense that those people & beings there are not limited by Distance or Time. Being in a higher or lower dimensions to our physical plane would mean that those there, could probably very easily descent into our lowly dimension from above and into any part of our physical universe, simply because they are not earth bound or even bound to our physical universe’s limitations or ‘laws of physics’. We today on planet earth can touch on our computer screens and instantly be whisked away to other places on the planet instantly. Perhaps those on other planets have a much better internet than we do, and thus can tune into our activities all the time just by getting on the exact right frequency? Jesus Christ came to re-unite us all with God and to bring in everlasting redemption for all souls that would receive Jesus as their Saviour and Redeemer to God. Is it just possible that the fallen angels and their ilk of evil entities are being more and more restricted and being pushed further and further downwards to eventually being in the big lock-up of Hell and the Bottomless Pit and then the Lake of Fire all within the earth. The negative world is sort of upside down and inside out and a ‘shrinking in size world’ as evidenced by ‘Black-Hole Stars’ are are the exact opposite of bright shining stars, just as Satan is the exact opposite of God God gives light like a star and Satan takes away and one is left with nothing but an in-gathering ‘Black Hole’. Those who used to be so arrogant such as Satan and his band of roving Fallen Angels who count in the millions or even billions, and who boasted themselves to countless civilizations of their superior technology and powers are themselves being driven downwards and restricted more and more each and every day! Just a thought, but what if the forces of Light are starting to fill up some of the planets closest to the earth in preparation for the Battle of Armageddon which is not just a physical battle but a supernatural battle involving both man and angels and fallen angels and countless entities. Perhaps they are also practicing with the ideas of warfare. Something that they have never had to contend with before in the spirit realm from whence they came. 20 BILLION PEOPLE ON OUR PLANET THROUGHOUT 6000 YEARS OF OUR HISTORY AND EVERY DECISION THAT THEY EVER MADE! If every person on earth has a guardian angel (or the potential to have one according to choices they make) not to mention countless guiding spirits or spirit helpers, just think how many QUADRILLIONS of actions done by humans that will eventually have to be corrected, in order to EVENTUALLY restore God’s entire creation to perfection again as it was in the very beginning. That will probably take at least another 1000+ years. There are many things that our heavenly counterparts can easily see us do in the Heavenly realm, but in preparation for God ushering in His Heavenly City closer to the earth during the soon-coming Millennium and to actually land the Heavenly City on the earth at the end of the Millennium; in a sense many people in heaven are going to have to learn how to interact on the physical plane, as the spirit plane is much more dreamy and infinite in possibilities as the spirit world is not limited by TIME or SPACE. All of this would tend to imply that God needs places for millions of His people to practice with similar conditions to those on the earth in preparation for both the Millennium and the New Heaven and New Earth. The physical planets would indeed make great places of practice and getting used to the physical dimension in preparation for the Millennium when millions of spirits and Saints will come to rule and reign over the whole earth’s population whilst Satan and his Forces of Evil both physical and spiritual are in the in the ‘lock-up’ of the Bottomless Pit. REV.20:1 And I saw an angel come down from heaven, having the key of the bottomless pit and a great chain in his hand. REV.20:3 And cast him into the bottomless pit, and shut him up, and set a seal upon him, that he should deceive the nations no more, till the thousand years should be fulfilled: and after that he must be loosed a little season. REV.20:6 Blessed and holy is he that hath part in the first resurrection: on such the second death hath no power, but they shall be priests of God and of Christ and shall reign with him a thousand years. REV.20:8 And shall go out to deceive the nations which are in the four quarters of the earth, Gog, and Magog, to gather them together to battle: the number of whom is as the sand of the sea. REV.20:9 And they went up on the breadth of the earth, and compassed the camp of the saints about, and the beloved city: and fire came down from God out of heaven and devoured them. REV.20:10 And the devil that deceived them was cast into the lake of fire and brimstone, where the beast and the false prophet are, and shall be tormented day and night for ever and ever. European Commission President Jean-Claude Juncker, talked in recent days with "several leaders of other planets, who are very worried because they ask questions concerning the way in which the EU will follow". AREA 51, ALIENS, ALIEN ABDUCTIONS, UFO'S, AND THE UNDERGROUND FACILITIES that allegedly honey-comb our PLANET. “OUT OF THE BOTTOMLESS PIT” that mention these above-mentioned very interesting topics. I have written extensively about UFO’S from a biblical perspective in my book “OUT OF THE BOTTOMLESS PIT” in chapter 6. ALIEN ABDUCTIONS in chapter 15. The Alien Question in chapter 26. 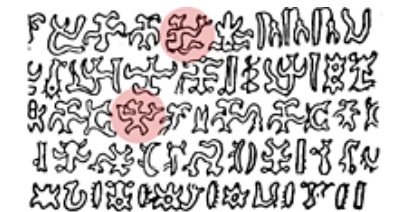 Aliens or Beings from INNER EARTH in chapter35. Do alien/Human Hybrids walk among us? In chapter 36. Full Disclosure in chapter 37. Close Encounters & Vampires, UFOs, Giants & Robots in Chapter 38. Flying Saucers & THE WAR of the Worlds in chapter 39. 1. There is a massive underground system composed of bases and compounds. These facilities contain labs, work shops for reverse engineering and secure “rooms” for the “Extraterrestrial Biological Entities” or EBEs for short. 2. In relation to number one, these bases were constructed toward the end of the Truman Administration. 3. Multiple humanoid races exist. 8. A treaty was signed between the U.S. and the Greys during the Eisenhower administration and a trade began. We would receive alien technology in exchange for a certain number of humans. The Greys use humans for biological research and possibly attempting to create hybrids to save their dying race ( via bozzfeed.com ). Millions of people are today knowledgable about the existence of UFO'S and "Aliens". As I testified in my book, I have personally seen UFO'S on at least 3 occasions, which fly in ways, that defy all known physical knowledge of aero-flight possibilities know to man. IS THE EARTH ACTUALLY SOLID & FILLED WITH MOLTEN FIRE OR IS IT IN FACT HOLLOW? ARE THE ALIENS MENTIONED ABOVE REALLY ALIENS, OR INNER EARTH INHABITANTS? “Disclosure” is a term that you can Google and there find numerous references to a coming “revelation” of “extra terrestrials”. “The powers that be” have been not only aware, but working with these entities, for a long time now. They have their reasons, and they are not good. A lot of different people from different disciplines (belief systems) have researched and documented all kinds of “encounters” with these entities, and the “sci-fi” media especially, as well as mass public eye-witness accounts of Ufo’s, human abductions, animal mutilations, crop circles, unexplained historical artifacts and events, dna tinkering, hybrid experimentation, inexplicable phenomena observed all over the Earth and in space, and an unprecedented increase in all these phenomena recently are all “leading up to something” – “disclosure”! Others, who proclaim to be Christian, specifically the hierarchy of the Catholic Church, are encouraging us to “welcome ET” as our “brothers”, and that these entities would probably be superior to mankind morally, even our “saviors”, due to their “good intentions” in sharing their superior knowledge, experience, expertise and technology with us. Then there are “new-agers”, such as the men featured in the videos found at the link in the messages below. Most of the world’s populations could easily believe that all of this will probably be a good thing, a “natural progression” or “evolution” in humanity’s development, “moving on”, especially when it presents itself as inescapable, “before your very eyes”. The way everyone will perceive this “disclosure” will depend on their personal belief system, but whichever or whatever that may be it will appeal to everyone, and this is the plan. The “disclosure” will happen when it is determined it will be most readily received, and we are being “prepared” for it by all the means just described above, as well as by “leaders”, “scientists”, “historians”, “journalists”, the media in all its forms (movies especially), and those propagating it on the internet! I could explain a LOT from what we have already been told in scripture, especially the “signs and wonders” that we will see, and “men’s hearts failing them for fear” as a result, and so on and so on. However, whether you choose to follow the link in the communication below (as an example of what is happening), or not, please take note of John’s and my comments. There is a way to determine whether these things are “good” or “bad”, and if you are not aware of this, and do not apply the counsel yourself to anything and everything in this day and age, whatever form it may be in, from “who” or “what”ever, then you risk falling into and under the “great deception” that my friend John refers to (and at your peril I will add)! These entities and dimensions are as real, if not more so, than the dimensions we can perceive with our natural senses in this life, and there are plenty of accounts in scripture that describe things that are pretty indescribable, as well as predictions and promises of things beyond the (B)asic (I)nformation (B)efore (L)eaving (E)arth we are given in The B.I.B.L.E. The thing is, there is a lot of truth in everything that folks are experiencing and sharing about these days, on every level, but the bottom-line always comes down to THE Truth, and The Lord Himself told us Who that truth is – Jesus. Everything else exists because He created it, and the spiritual entities have to make their choices as to who they will believe and serve, just like we do, hence the whole “war” evil declared against the good – God and His whole creation and plan for us, man, who He created in His own image, and including “the universe” or what more accurately should be called “multi-verse” as in incorporating all of the dimensions that exist outside our current perception. It all comes down to our Creator, Jesus, it’s ALL about Him, “by Him all things consist”, and anything outside of that fact is not going to be “the truth, the whole truth, and nothing but the truth” right? If you do not give me the Bull of Heaven, I will knock down the Gates of the Netherworld, I will smash the doorposts, and leave the doors flat down. And will let the dead go up to eat the living! And the dead will outnumber the living. As was recently highlighted in an excellent article by The Rutherford Institute, universities, individual states and the U.S. government itself has referenced the "Zombie Apocalypse" in research papers, drills and, in the case of the CDC a zombie apocalypse preparation kit that "details everything you would need to have on hand in the event the living dead showed up at your front door." According to CNN, the Pentagon even has a "Zombie apocalypse plan," in an unclassified document titled "CONOP 8888," which includes preparing for Zombie life forms "created via some form of occult experimentation in what might otherwise be referred to as 'evil magic,' to vegetarian zombies that pose no threat to humans due to their exclusive consumption of vegetation, to zombie life forms created after an organism is infected with a high dose of radiation are among the invaders the document outlines. The Rutherford Institute details far more about CONOP 8888, while highlighting the coincidental timing of playing around with the idea of using "zombies" in drills with a 2008 report, warning that an economic crisis in the U.S. could lead to massive civil unrest that would require the military to intervene and restore order. After detailing how 8 million Americans are now considered a threat to national security , the Minerva Initiative, a $75 million military-driven research project focused on studying social behavior in order to determine how best to cope with mass civil disobedience or uprisings, the 2009 report on Rightwing and Leftwing Extremism, local police being transformed into extensions of the military, taught to view members of their community as suspects, trained to shoot first and ask questions later, and equipped with all of the technology and weaponry of a soldier on a battlefield, the U.S. government listing segments of the American population as greater threat to America than ISIS or al Qaeda, the Rutherford article states "We the people” or, more appropriately, 'we the zombies' are the enemy in the eyes of the government." The U.S. military and Department of Homeland Security has held "zombie drills" spending tens of thousands of taxpayer dollars, claiming the use of zombies was to 'add levity" as was explained by ABC News at the time, while the Winnipeg MP Pat Martin asked Foreign Affairs Minister John Baird about America's ongoing preparations for the Zombie Apocalypse in a mocking manner. 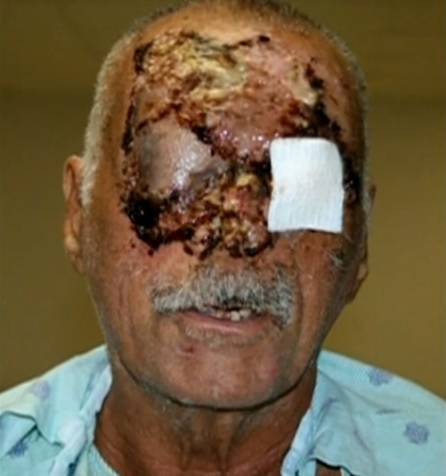 In 2012, CNN headlined an article with "Miami 'zombie' attacker may have been using 'bath salts', where they stated "A naked man who chewed off the face of another man in what is being called a zombie-like attack may have been under the influence of "bath salts," a drug referred to as the new LSD, according to reports from CNN affiliates in Miami." In 2013 the LA Times reported on a study of "zombie" drug bath salts, while other drugs such as "Devil's Breath" reportedly "turns victims into zombies," as RT reports in September of 2015. Also in 2012 it was reported by Natural News, that a drug called scopolamine "blocks a person's ability to form memories, and temporarily inhibits his ability to make free will choices." When inhaled or consumed, in other words, scopolamine can turn any person into a robot that will do whatever another person tells him to do, even if it means robbing his own house. Another drug called Flakka is apparently considered a "zombie drug" as reports of crimes in the U.S., UK and France, all reference not only the drug, but state the drug sparks "zombie-like" behavior. The above referenced articles are simply a small example of what is out there regarding drugs that cause "zombie-like" behavior. Below are two of the many examples shown in Part 1 of THE CALLING FORTH OF THE DAMNED: The Zombie Resurrection and THE DAY OF THE LORD, showing historical references and accounts of "undead plagues," including the following from the The Zombie Research Society: Lost Colony at Roanoke 1587, where some believe the "plague" spoken of could still live in the soil and Easter Island. Freeman considered the findings of noted Harvard Archeologist, Lawrence Stager, who unearthed evidence of mass cannibalism at the Roanoke site. He also points to reports from local tribes stating that the colonists died in a great war within their own ranks. He goes on to suggest that the relative isolation of the settlement, and time elapsed before the return of the supply ship, would allow for the remaining colonial zombies to rot back into the earth. Without any humans left to feed on,so no way to spread the infection, the zombie outbreak would have simply died off. If Freeman is correct, there could be something sinister still in the ground on Roanoke Island, waiting to be released into a modern population that is more advanced, more connected, but just as unprepared as ever. 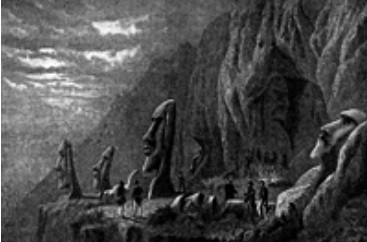 Clues include the as yet undeciphered Rongorongo script of Easter Island,which has characters that are clearly inspired by the undead. We already know that scientists have no problem recreating viruses such as the Spanish Flu which killed 50 million people in 1918, which has been criticized as a "catastrophic risk," by other researchers. We also know that scientists are trying to "reanimate" prehistoric viruses discovered frozen in the permafrost of Siberia. Those are only two examples and an in-depth investigative report by USA Today in 2015 uncovered "hundreds of lab accidents and near-miss incidents that occurred in biological laboratories working with dangerous pathogens in recent years, putting scientists and sometimes even the public at risk." These labs are all working with working with "select agents" — the government's term for viruses, bacteria and toxins that have the potential to be used as bioweapons. Since last summer, lab safety has drawn concern from the public and policymakers in the wake of several high-profile accidents at federal laboratories. Last year, labs at the CDC had serious mishaps with anthrax, Ebola virus and a deadly strain of avian influenza, and forgotten vials of deadly smallpox virus were discovered in an unauthorized storage room at the National Institutes of Health. In recent weeks, the Pentagon has scrambled to locate dozens of live anthrax specimens an Army lab in Utah mistakenly shipped to labs across the country and abroad for 10 years that were believed to have been killed with irradiation but weren't fully inactivated. These incidents are just a few of the hundreds that have occurred in recent years at labs operated by universities, private defense contractors and government agencies, the USA TODAY investigation revealed. "The number of lapses in biosafety that were uncovered is alarming," said Amesh Adalja, a senior associate at the UPMC Center for Health Security, a think-tank that studies policy issues relating to biosecurity, epidemics and disasters. In September 2015, The Daily Mail reported on a man that was pronounced dead and then buried in 1962, showed up 18 years later described as a "heavy-footed, vacant-eyed man." He had supposedly been "resurrected" by a witch doctor. So while the Canadian House of Commons laugh and the U.S. military and the DHS claim the use of a threat of a "zombie apocalypse" is for levity and CDC spokesman Dave Daigle told FoxNews.com that their zombie preparedness campaign was "tongue-in-cheek campaign," to take advantage of the popularity and the idea was "reaching an audience or a segment we'd never reach with typical messages," knowing that there are multiple drugs in existence today that have already caused cannibalism and zombie-like behavior. In December 2014, the Inquistr wrote "Out of the many predictions for 2015, a zombie apocalypse virus probably seems like a bad joke considering the recent Ebola epidemic. Unfortunately, a bioweapon made using an artificial virus has recently become feasible, making the possibility of a zombie virus seem real." The hard part would be introducing the bloodlust common to all zombie movies, but back in 2012, a Florida man named Rudy Eugene acted like a real life zombie. Initial reports falsely claimed bath salts or some other drug were at fault for this zombie-like behavior, but it’s still possible an artificial virus could attempt to mimic similar effects on the brain. Besides an artificial virus intended to be a bioweapon, there’s also the zombie apocalypse scenario envisioned by 28 Days Later, where a modified version of the Ebola virus intended for medical purposes eventually transformed into the zombie Rage virus. This scenario is not completely hypothetical, since Exxell BIO, Inc. is currently working to produce an Ebola vaccine based upon a live, chemically-inactivated rabies virus containing Ebola glycoprotein within its structure. Is it really a stretch to imagine these drugs being weaponized, injected into a water supply, aerosolized or even delivered via chemtrails? Is it also beyond the realm possibility, given the hundreds of lab accidents discovered recently that one of those pathogens or viruses that could be used as bio-weapons that scientists have been working with could either 'accidentally" be released or fall into the wrong hands? Whole neighborhoods, towns or cities, even states could literally be turned into "zombie" infested quarantine zones. 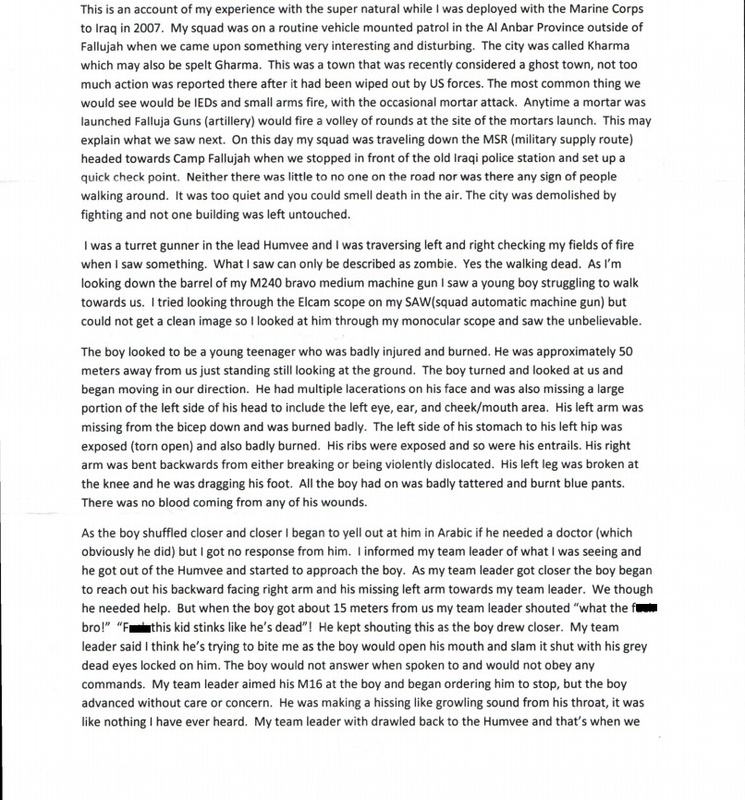 Below are 3 screen shots from a scanned letter converted to PDF a trusted source sent to us, verifying the identity of the military member and his bonafides, showing that there may already be at least one town and no-go zone, in Iraq, full of the walking dead. WARNING, VERY GRAPHIC EYEWITNESS ACCOUNT OF ZOMBIE GORE - NOT FOR CHILDREN! For those that do not think it would be so easy to lock down the nation, many point to the amount of veterans and gun owners claiming they would prevent it, they should ask themselves if this isn't the exact reason we consistently see the push for more gun control and how the "talk" has now segued into "gun confiscation, as evidenced by recent statements from Democratic presidential hopeful Hillary Clinton with talk of "mandatory" gun by back programs, or previous statements about gun control via executive action. Also consider the news from October 2014, when the Ebola scare hit American shores and it was announced that the U.S. military had formed an "Ebola rapid-response team" to be utilized in country, consisting of five physicians, 20 nurses and five certified trainers. This rapid-response team would be deployed "on the request of the U.S. Department of Health and Human Services," and would "supervise treatment and help hospitals deal with the intricacies of treating Ebola." Hence, the military is already actively involved in anything related to a medical "outbreak" on U.S. soil. Zec 11:9 Then said I, I will not feed you: that that dieth, let it die; and that that is to be cut off, let it be cut off; and let the rest eat every one the flesh of another. Lamentations 4:10- With their own hands compassionate women have cooked their own children,who became their food when my people were destroyed. Ezekiel 5:10 - Therefore the fathers shall eat the sons in the midst of thee, and the sons shall eat their fathers; and I will execute judgments in thee, and the whole remnant of thee will I scatter into all the winds. From ancient texts and biblical references, to the start of the "zombie" genre in the 1960s, to government preparedness and drills, to drugs that cause "zombie-like behavior, to the recreation and reanimation of super viruses, to creating and weaponizing a "zombie virus," those that think it could only happen in science fiction haven't done their research. There are multiple methods of literally creating a world of cannibalistic "walking dead."